Svenska Fotbollförbundet (SvFF) (English:Swedish Football Association) was founded on 18 December 1904 and is the sports federation responsible for the promotion and administration of organised football in Sweden and also represents the country outside Sweden. SvFF is affiliated to the Swedish Sports Confederation (RF) and the Fédération Internationale de Football Association (FIFA) and Union of European Football Associations (UEFA). The first Swedish national football championship was played in 1896 but it was 7 years later in 1903 that the Riksidrottsförbundet was formed which was to be the precursor to the Svenska Fotbollförbundet. The new organisation had a football and hockey section (hockey being the term for bandy at that time and not ice hockey or field hockey). In 1904 Sweden was one of 7 nations that founded FIFA. It also introduced ice hockey to Sweden in 1920, before the 1922 establishment of the Swedish Ice Hockey Association. Before the 1925 establishment of the Swedish Bandy Association, the Swedish Football Association also administered organized bandy in Sweden. 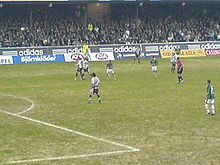 ^ "The Swedish FA – Svenskfotboll.se". Retrieved 2011-01-11. ^ "Swedish Football of Today – Svenskfotboll.se". Retrieved 2011-01-11. ^ "Milestones of Swedish Football – Svenskfotboll.se". Retrieved 2011-01-11. ^ "The Swedish League System – Svenskfotboll.se". Retrieved 2011-01-11. ^ "Kontaktuppgifter och tävlingar – Svenska Fotbollförbundet – Svenskfotboll.se". Retrieved 2011-01-10.